When people think about eating healthy, they often picture bland grilled chicken on a bed of dry lettuce. While plain old grilled chicken day after day is certainly boring, eating a healthy dinner doesn’t have to be. This grilled chicken recipe is full of delicious flavor thanks to the chimichurri sauce, a green sauce made with herbs, oil, and vinegar. It is originally from Latin America and served alongside grilled steak or chicken. Chimichurri is a great way to spice up healthy meals without adding too much sodium. In this recipe, I left out the salt, but you’ll never miss it with so much flavor from fresh herbs, spices, vinegar, and garlic. Grilled chicken skewers are fun to make on the grill when the weather is nice, but you can also make them inside on a grill pan. I love using cherry tomatoes, but add any kind of vegetable that you have on hand. This dish makes a great high-protein, a low-carb dish that’s both easy to make and delicious! Serve it with a green salad and brown rice or black beans to round out the meal. Make the chimichurri sauce. In a blender or food processor, combine ingredients for chimichurri sauce (everything except the chicken and cherry tomatoes) and blend until smooth. Cut chicken breast into 1-inch cubes. Place in a zip-top bag with half of the chimichurri sauce. Let marinate in the refrigerator for 20 to 30 minutes. If using wooden skewers, use this time to soak skewers in water. Thread chicken onto metal or wooden skewers, alternating between chicken cubes and tomatoes. Heat a grill or grill pan to medium-high heat. Spray with oil and grill skewers 2 to 3 minutes per side. Reduce heat to low or move skewers to top rack of the grill until finished cooking, about 10 to 15 minutes. The chicken should reach an internal temperature of 165F. 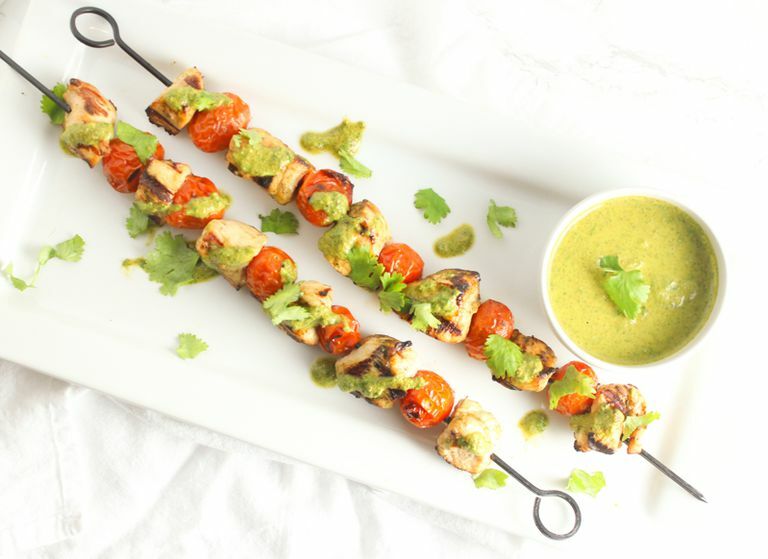 Serve skewers with remaining chimichurri sauce. If you don’t have red wine vinegar, almost any vinegar will do. White balsamic or apple cider vinegar works nicely, or in a pinch, just add extra lime juice. Try adding other vegetables, like mushrooms, bell peppers, or zucchini, to your skewers for extra flavor and to pack in more fiber. Adjust the crushed red pepper to your desired spice level. While the chicken marinates, steam some brown rice or quinoa or heat up a can of low-sodium black beans. These skewers also pair nicely with a green salad. Carefully slide chicken and tomatoes off of the skewers when serving to avoid smashing the tomatoes.